Acadian Genealogy Homepage; Guillaume (Billy) Johnson Book: His Story, Our History. This soft cover, 169 page book has many colour and B&W photos, diagrams, and charts to give the reader an up close and personal look at the Acadian way of life, as well as covering the genealogy of the Johnson Acadian family. More than just a book on his family tree, Phil Johnson has created an easy to read and highly informative book on his Acadian past. This is a thoroughly researched work that has taken 10 years to complete. As the title indicates, this is a book which details the life of Billy Jr, the son of a Scotsman (William  Guillaume  Johnson) who was part of the occupying forces at Port Royal after 1710, and an Acadian woman (Isabelle Corporon). Not only has the author captured the Johnson family heritage in story form, he has included all reference sources to aid other genealogy researchers in their quest for factual documentation relating to the Acadians, and to this particular branch of Acadian Johnsons. The colour and B&W photos along with the many charts help to broaden the perspective of readers, and provide a rare glimpse into the lives of those whom this book is written. Additionally, the early chapters documenting the Acadian way of life and the lives of the soldiers, broaden the knowledge base of what is known about the life and times of the peoples found in the Maritimes during the 1700s. A ninth generation Acadian, Phil Johnson has always had a love for historical detail and in particular, with his Acadian heritage. He grew up in the nomadic life of the son of a Royal Canadian Air Force father. Moving from base to base about every 3 years, Phil saw much of Canada while growing up. Although this was a great experience, he was also frustrated with not having any roots to truly call home. Ironically, Phil also decided on a military career and served in the Canadian Air Force for 24 years, retiring in 2000. He married his wife Heather in 1978 and they raised 2 children, Rhiannon and Ryan. They currently reside in Dartmouth, Nova Scotia. Phils quest for knowledge of his past led him to begin research and writing this book, with the witty and lovingly sarcastic support from his spouse and children. He is currently working on the second book to this one, to detail his parents history, and that of his own and his family. As well, Phil is actively researching details to enable him to write a factional story about Billy Jrs life as an Acadian guerrilla fighter during the time of the Deportation until his capture and imprisonment at Fort Edward, NS in 1762. Click Here To Order directly from Phil. Yvon Cyr reviews Phil Johnson's Acadiana genealogy book, Guillaume (Billy) Johnson: His Story, Our History ($24.95), on his Canadian-Louisiana Web site, www.acadian.org. The softcover book has many photos, diagrams and charts "to give the reader an up close and personal look at the Acadian way of life, as well as covering the genealogy of the Johnson Acadian family," Cyr writes. Billy was the son of a Scotsman who was part of the occupying forces at Port Royal, Acadie (later Nova Scotia), and an Acadian woman named Isabelle Corporon. 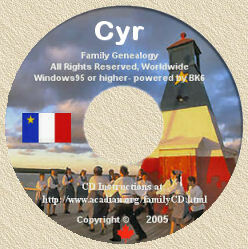 "Not only has the author captured the Johnson family heritage in story form, he has included all reference sources to aid other genealogy researchers in their quest for factual documentation relating to the Acadians, and to this particular branch of Acadian Johnsons," Cyr writes in his online review.